10 Copies to Give Away! It’s a bit overdue, I admit, but I’m pleased to say that Polly Workbook #5: Get Published is in the final design and proofing stage and will be released in PDF format and made available for download in the LTC store in the coming weeks. Publishing–particularly the process of getting one’s own creative work published–is an overwhelming topic. At least, outside being a staff writer or a ghostwriter for hire, it is. I have had my own creative work published and have self-published, as well, and I can honestly say that that it is far easier to be paid to write for others than it is to sell your own work. But you can’t just create based on the ideas of others; wordsmiths also need to express themselves. To paraphrase Ms. Whitford: the world needs our words. Knowing how to get your work–your words–published and out on the market is really important, which is why I feel that this workbook is long overdue. But, when I reflect on the past three years and the process of self-publishing two novels, I think there were aspects of publishing that I needed to experience before I felt I had the authority to write and give solid, practical advice on the topic. 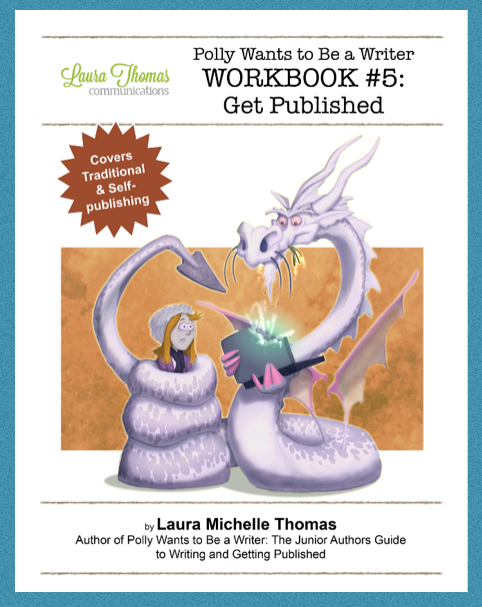 As part of the launch of this workbook on how to get published both traditionally and by self-publishing, I would like to give away 10 free copies to young writers who are ready and willing to get out there and start selling their work. You can enter by sending an email to me (my address is on the contact page) with the subject header: WORKBOOK 5 GIVEAWAY. In the email, please include your name, age and country, and a sentence or two (or more) telling me why you want this workbook. Enter by midnight LTC time on February 1, 2016. Winners will be contacted February 2nd. On what grounds would the winners be selelcted? Hi Amilly. I will do a draw. Yes!! Exactly what I need!! Perfect timing! !